Capoeira developed as a method of revolt by Afro-Brazilian slaves during the 1600’s. A common practice of the time, African slaves greatly outnumber their masters. So a majority of the population was made up of Afro-Brazilians with a deep history of warfare. These slaves brought their tribal culture and spiritual heritage with them. But the Portuguese owners refused to let them practice any martial arts. Despite the ban, the slaves continued to practice in secret. Escaped slave colonies were bastions of the art form and contributed to the spread of the techniques. Some of these colonies numbered in the tens of thousands with dedicated security. A student of the style is a capoeirista. Under constant threat of discovery and returning to enslavement, the founding fighters disguised their training to look like dancing. The inclusion of dancing and music fundamentally flavored capoeira differently than pretty much all other martial arts styles. With the fall of colonial power in Brazil, capoeira was outlawed but still practiced. The music and circling musicians called the rodas are a key part of training, each player adding tension and energy to the fight. The rodas circle provides energy to the fighters but also alerts them to police or other threats. But the rhythmic movements of capoeira make it difficult to predict as all moves eventually end up back at the swaying neutral position they call the ginta. The mock battles are cerebral in nature, each fighter trying to trick their opponents into exposing a weakness. This theme of misdirection and disguising strength is a central pillar of capoeira. The move list consists of kicks, elbows, knees, and strikes from unorthodox angles that are difficult to predict. The rhythm of the music helps the capoeiristas time their moves to create a single seamless motion. The instruments commonly carried by capoeiristas called berimbau can conceal or themselves be used as deadly weapons. This single-stringed instrument produces a unique and mesmerizing sound when played in a rodas. It wasn’t until the 1900’s that the style was codified and recognized as a legitimate martial art. But in the process, two masters appeared with conflicting ideologies about tradition. Yet both came from the tough streets of Brazil’s Favelas. Capoeira remains a technique developed and refined in Brazilian poverty as the current masters of both schools live in some of the poorest areas of Brazil. Mestre Bimba came to prominence as a fighter in Salvador de bahia ( a favela in the city of Salvdor) in the early 1920’s as repression of the style was dying down. Feeling that the style was moving away from its combat heritage, he codified many of the moves. By 1932 he was able to open his own school teaching the capoeira mestres fighting style. But there were others in the community that disagreed with how Bimba went about his work. When capoeira finally lost all legal penalties in 1941, Vicente Ferreira Pastinha opened his own school in another section of Salvador called Pelourinho. With a greater focus on traditional forms and techniques, the competing style of Vicente Ferreira Pastinha became known as capoeira angola. Both masters have become living national treasures in Brazil with many distinguished students. Despite this, they both still live in relative poverty in the favelas. Both Pastinha and Bimba continue to teach impoverished youth in Salvador Pelourinho and de bahia respectively. Capoeira is designed to be used when outnumbered and outgunned so it tries to avoid stopping at all costs. The base stance (known as the ginta) is versatile, allowing strikes and dodges from many angles or positions. The legs are the primary striking weapons with assistance from counters, takedowns, and feints. Literally translating to ‘swing’ or ‘rock back and forth’, the ginta naturally helps capoeiristas react quickly. It also has the benefit of making the capoeiristas more difficult to strike and otherwise engage. The broad, swinging motions of the ginta also ensure a wide stance for resisting or delivering devastating takedowns. Modern capoeiristas rarely train with edged weapons, instead focusing on unarmed combat. Despite a general lack of training with weapons, capoeira does have moves for using and dealing with a variety of threats. Training includes knife, straight razor, scythe, club, double-edged dagger, machete and cane sword forms along with moves to counter guns. As mixed martial arts (MMA) gained prominence in the early 2000’s, capoeira’s flashy and surprisingly effective moves allowed it to find a home in some of the toughest competitions in the world. 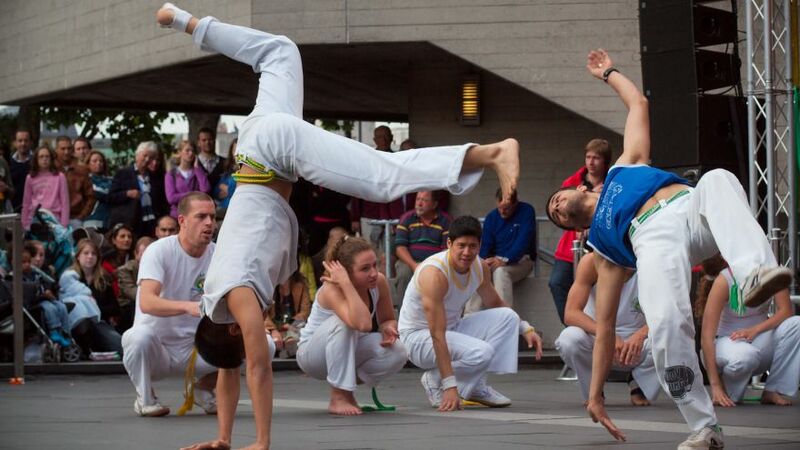 The success in the ring and the spectacularly flashy moves help both styles of capoeira flourish abroad. The brutal landscape and history that this style evolved from make it a complete combat system. Masters of this art survive actual street fights and win MMA competitions from time to time. Some of the most spectacular knockouts in UFC history involve a capoeira spinning back kick or rolling takedowns. Capoeira is deceptively complex as a fighting style with a focus on practice. It takes years to master the fundamentals of timing and develop the muscles needed to roll, twist and flip for minutes on end. Fitness plays a major role in performing at a competition level. But this is a style designed for people and by people with nothing but each other. It’s a deceptively effective martial art for the streets of Brazil most dangerous favelas. https://www.youtube.com – Sports Worldwide Channel – When Capoeira meets MMA!